There are a lot of terrific stories in the Arabian Nights Collection. The trouble is that they're hidden in pages and pages of long, boring, repetitive nonsense most of which is not suitable for children...or adults...or anyone really. But that's why you're lucky to have me! I took the good bits, cleaned up some of the other bits and put them together in a new version suitable for kids and people of all kinds of ages. The Sultan has been cursed into hating all women! He vows to take a wife for one night, execute her the next morning, and take another wife the next night. Thankfully, the clever Scheherazade volunteers to be his first bride and entertains her new husband with a long, complex story which takes more than one night to tell. When it's over, she starts a new story and so on and so on for one thousand and one nights to save not only her life, but the lives of her entire kingdom and the soul of her beloved king. Along the way, read all about the poor boy who finds a genie in a lamp and becomes a prince, or the impoverished merchant and his family who outwit a band of terrible thieves. Meet the hunchback who spent his life (and death) making people laugh or the prince who got turned into a monkey, or travel with Sindbad on one of his voyages across the seven seas. The stories are exciting, entertaining and (because this is Galleons Lap) full of nonsense. Buy your copy today right HERE. And, remember, you can also buy Once Upon a Time and Long Ago or Shelly Hobbes: Master Detective at Lulu.com and other fine online retailers. 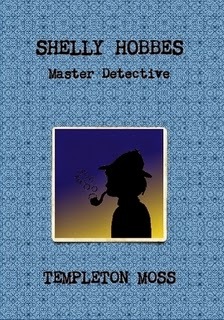 SHELLY HOBBES: MASTER DETECTIVE--NOW AVAILABLE! This is to announce that my second print book 'Shelly Hobbes: Master Detective' is available for purchase NOW! When Warren arrives at the foster home on East Treebark Street, he assumes it will be just like all the other homes where he never quite fit in. But then he meets his roommate, Shelly, who wants to be just like Sherlock Holmes. The two quickly become friends and embark on a series of exciting adventures together. Whether it's finding out who stole the answers to the big test, uncovering the secret of a club for kids with red hair or learning the truth about the mysterious dog monster of Grimpin Park, Shelly and Warren are a perfect team. And their adventures will make the perfect addition to your library. The adventures of Shelly Hobbes and Warren are loosely adapted from the original Sherlock Holmes stories by Sir Arthur Conan Doyle and include dozens of references, homages and Easter Eggs for fans of the classic detective. But, even if you've never read 'A Study in Scarlet' you'll enjoy 'Studyin' Scarlet,' in which a mysterious rash of tummyaches spreads across the Foster Home on E. Treebark St.
You don't have to know about 'The Red-Headed League' to appreciate the mystery of 'The Redhead's Club,' a comparatively simple mystery which nonetheless changes Warren's life forever! And even if the legend of 'The Hound of the Baskervilles' is new to you, the story entitled 'Of Baskerville, the Hound' should be enough to entertain the whole family. So log on to Lulu.com today to order your copy of Shelly Hobbes: Master Detective. And, while you're there, don't forget to add Once Upon a Time and Long Ago to your cart. And keep your eyes open for 1001 Arabian Nights, coming very soon!